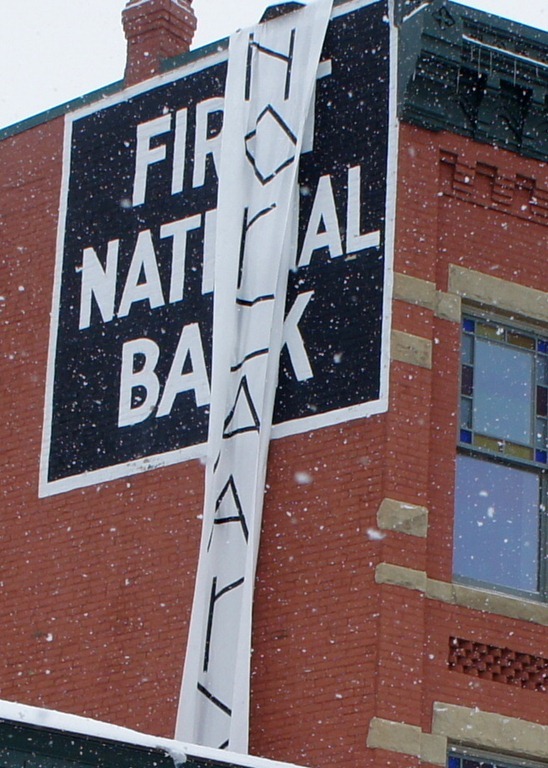 First National Bank of Northfield gets a banner. What the hell does it say? 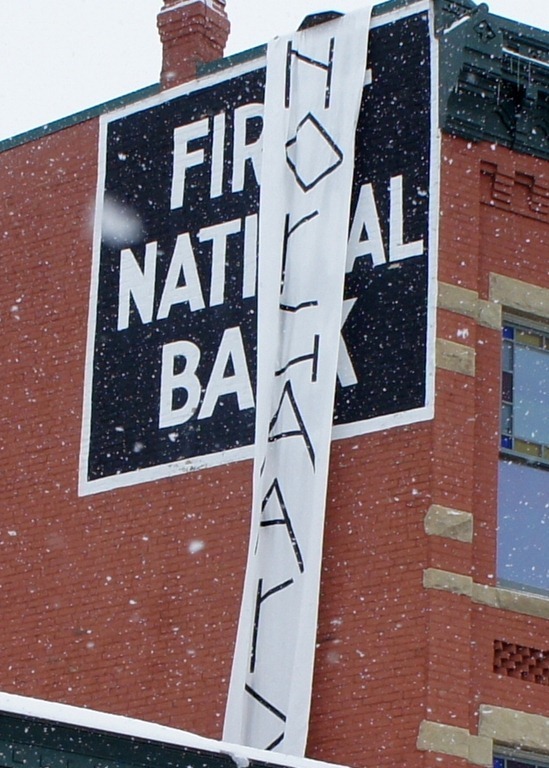 I got a call from a LoGro regular this morning about a banner hanging from the top of First National Bank of Northfield. I took these photos at about 1:30 pm. The breeze was too light to unfurl it completely, so I have no idea what it says. The banner is still there this morning, but with no wind, it’s even more obscured than yesterday. “Norgaard.” For Bjorn, I presume. It says “If you can read this, you’re tail-gating this building!” But it says it in Finnish or Klingon or something. hey, let’s NOT be making fun of Finnish…. One of the guys I work with is of Finnish ancestry, and often holds conversations with his wife in Finnish. Strangest sounding language I’ve every heard, and I’ve heard quite a few over the years, and the first time I ever heard it I honestly wondered if it were Klingon! I believe it is one of the few world languages not considered closely related to any other language, which would certainly explain why it sounded so strange to me. I think it says Norgaard. It is for Bjorn. Taking another look, I believe Jane is quite right. Ahh, makes sense. Thanks, y’all. EPIC bannering at its best. Shucks! 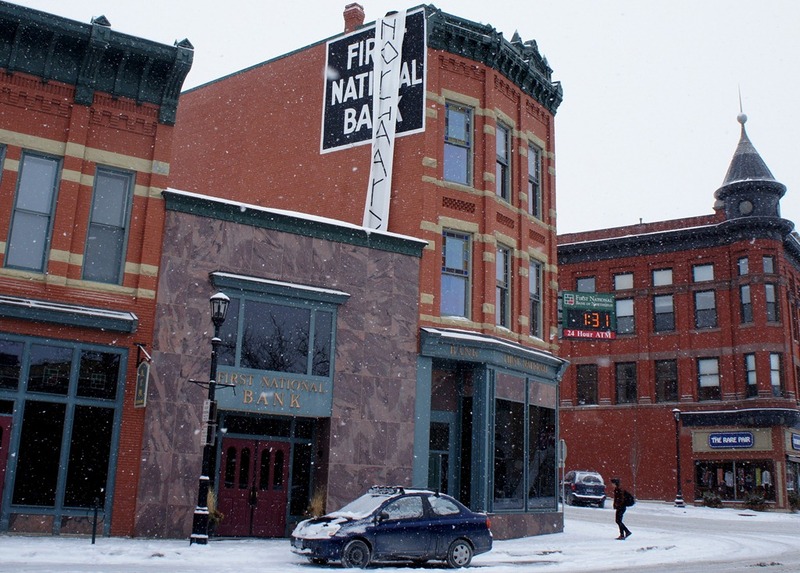 I thought maybe the city was going to run the Motokazie race through town and the bank was going to be the Finnish line!